Jack Osbourne and Lisa Stelly married little over two weeks ago, but now the official pictures of their wedding have been published by Hello! magazine. The youngest of the famous family said his “I do” to his girlfriend Lisa Stelly in a lavish ceremony at the Four Seasons Resort in Hawaii. The couple have a five-month-old daughter, Pearl Clementine, together, and she was the guest of honour. The star pair’s wedding pictures, which appear in this week’s Hello! Magazine, show just how magical their day was. The images show Lisa Stelly looking every inch a bride in a classic white satin wedding dress, featuring an embroidered neckline, and a lace veil. Baby Pearl Clementine was also dressed in a white wedding outfit for the occasion, and even sported a veil just like mummy. The lovebirds were joined by 48 guests, including the famous Osbourne clan, during the ceremony and party on the romantic island. 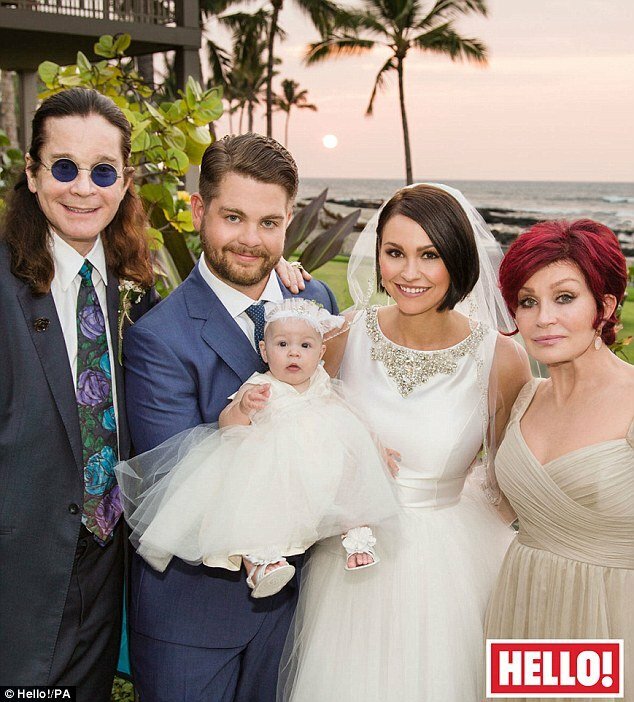 And the emotional ceremony was definitely a family occasion, as Jack Osbourne’s sister Kelly served as a bridesmaid, and his mother Sharon also happened to turn 60 on the day of her youngest son’s wedding. Kelly Osbourne recently told an Australian radio show she couldn’t stop crying when she heard her son say his vows. “He did get married and it was wonderful! Oh my goodness I cried, people thought I was sad, but it was tears of joy,” she said. And the day after the nuptials, Jack and Lisa’s honeymoon took a dramatic turn, as the youngest of Osbourne’s helped save a woman from drowning. Jack Osbourne leaped into action with a few friends when he saw a woman struggling to swim in the ocean, after she had a heart attack. His proud wife immediately took to Twitter to tell the world about her new husband’s brave rescue.